Saturday, November 25 enjoy holiday shopping in the our small town on the bayou for our Merchant’s Open House! Sunday, November 26 come to our annual Christmas Parade as Santa arrives in Breaux Bridge. Parade starts at the Armory Hall on Bridge Street, turning on Rees Street ending on Refinery Road. Parade starts at 2:00PM. For more information call 337-332-8500. 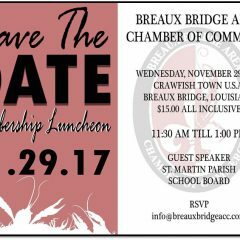 Mark your calendar for the November Membership Luncheon at CrawfishTown USA on November 29.